Caught in pulsing states of desire, Beyond the Clouds, is a photo series capturing the starving sentiments of solitude – and every ember of lust and longing that comes along with it. The book, designed by renowned Japanese art director and graphic designer Hideki Nakajima, beautifully compiles photography by HART+LËSHKINA, and ultimately aims to unfold delicate layers of psychological experience. As an artistic duo, HART+LËSHKINA professionally formed back in 2013 and have since served as visual creators to some of the world’s leading labels (clients have included Calvin Klein and Hugo Boss). This project, however, steps away from trend-charged consumerism and instead focuses on the raw simplicity of the senses, time and psychology. Flicking through the book’s haunting spreads, each subject is presented at varying states of vulnerability: cold, isolated, undressed. It becomes clear that the central theme of Beyond the Clouds is “the human body burdened by its own impermanence”, as each photograph ensues a motion of physical or psychological transition. Not only does the project break away from comfort in concept, but also in production. As HART+LËSHKINA travelled, they shot subjects in Russia, France UK, Japan and the US. 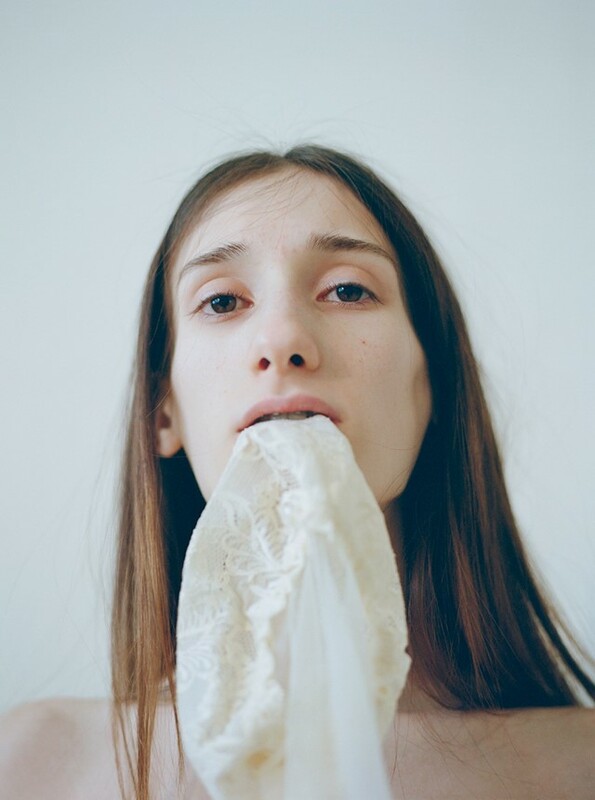 The intimate garments featured – stockings, tights, bra and night slip – were all found on the outskirts of Moscow, each carrying a naked anonymity and unique history. Pulling back the opalescent veil and delving into the intricate details, we posed a few questions to the photographers to find out more about the inspiration and ideas behind Beyond the Clouds. First of all, tell us a bit about both of your photography backgrounds? Also, where are you from? Where are you based now? HART+LËSHKINA: We live in New York but spend majority of the time traveling. Originally we are from Los Angeles and Moscow. We met in London and have been collaborating for four years now. We both started taking pictures in our early teens. Our main interest in photography is constructing open narratives that feel tactile, intimate, visceral and evocative. We are drawn to the grey area and tension between reality, illusion, dream and memory. You are capturing impermanence in a permanent way – by immortalising these in a printed book. What draws you to impermanence and the transient nature of our selves? HART+LËSHKINA: For us every photograph is all-pervadingly marked by impermanence. Susan Sontag’s most famous quote probably says it best: “to take a photograph is to participate in another person's mortality, vulnerability, mutability. Precisely by slicing out this moment and freezing it, all photographs testify to time's relentless melt.” We are interested in capturing the beauty of things imperfect, ephemeral, transitory – collecting and preserving them. Beyond the Clouds draws on the fundamental cycles of life and explores the extraordinary in the mundane with poetic subtlety. All the photographs are pastel and filled with light, however the subject matter is heavy and is at odds with this surface. The images display impermanence and allude to the passage of time. The images were shot across five countries, can you tell us why you chose to shoot across such vastly different locations? HART+LËSHKINA: Locations are not identifiable in any of the photographs, it is more about the underlying human emotions that connect our subjects. The objects and people in the book are often isolated and shown in environments that are anonymous. A white room in Tokyo, blends right into an apartment in NY, or a studio in Los Angeles or a flat in London. The reason why it was shot across so many countries was simply a result of our travels. The garments were found on the outskirts of Moscow. Can you tell us how exactly you went about finding them and what drew you to these items in particular? HART+LËSHKINA: We wanted to have something that will strip all the individuals photographed from their context, hence we didn’t want to photograph them in their own clothes. We used the garments to act as a physical thread and second skin which connects this diverse group of individuals who appear in the portraits. You mention these subjects were caught in moments of physical or psychological transitions – can you explain that a bit more? HART+LËSHKINA: Finding beauty in different states of transition, in in-between moments is something we always come back to. Subjects of the portraits in the book are all going through physical and/or emotional changes: a young girl about to enter adolescence, a teenager on the verge of adulthood, transgender woman’s physically changing body, an aged man discovering his sexuality, an older woman’s body being transformed by terminal illness. How did the name Beyond the Clouds come about? HART+LËSHKINA: For us the name Beyond the Clouds is both poetic and generic. We wanted the title to conjure the obscure, mysterious and unknown as well as allude to mortality. Can you tell us what it was like working with Hideki Nakajima. Why did you choose to work with him? HART+LËSHKINA: Hideki has designed some of our favourite photo books such as Mark Borthwick’s Synthetic Voices, Rinko Kawauchi’s Aila, Vincent Gallo’s Brown Bunny, Ishiuchi Miyako’s Innocence, and many others. When we met him the first time in September last year we were still in the middle of working on Beyond the Clouds. We showed him some of the images from the project and he offered to design the book right there and then. We had an immediate understanding between us. Hideki’s work is always sensitive to the artist’s vision and aesthetic but full of his own signature details. He is passionate about his work and the work of artists he collaborates with.